Boat launching tip #1: Always keep the safety chain on until the trailer is in the water! The safety chain is important. Straps, ropes, and cables are all useful when it comes to getting your boat back on the trailer. But they all have a limited lifespan. It’s only a matter of time before your cable, rope, or strap reaches the end. And when it does, you want to be sure that your boat isn’t going to end up skidding down the ramp! Craning your neck to see what’s going on is a hard way to reverse a boat. Often, you can see less, and it’s harder. Our advice: rely on your rear-view mirrors to tell you where your boat is heading. That will help keep your neck intact. It will also help you with tip number 3! This boat launching tip is one of the most useful for first-timers. Basically, the tip is to watch both rear-view mirrors and wait until the boat appears more in one mirror than the other. When that happens, simply turn the steering wheel slightly in the direction that the trailer is going. That should correct the trailer and keep it on the straight and narrow. In some 4wd vehicles, the 4wd driveline only engages when the hubs are locked. That makes those vehicles useful for launching and retrieving boats. The reason is simple: you can engage low-range without placing too much strain on your driveline. Simply select low range but leave your hubs unlocked. This will give you all the torque you need, without damaging your clutch or differentials. If you’re heading out for a fish with mates, why not call on them for a hand. Get someone to spot you down the ramp if you’re not feeling completely comfortable with the launch. Having a second set of eyes is a great way to ensure that nothing gets damaged. Boat launching tip #6: Position your boat and car straight-on to the ramp – angles are bad! For a first-timer, reversing a boat on an angle is hard to correct. After a while, you’ll get the hang of manoeuvring a trailer every which way. But for your first few goes, try and make sure you only need to reverse in a straight line. On an especially low tide, you might have to consider where the ramp ends. All boat ramps only extend a certain distance. That means somewhere underwater is a substantial drop off. If you’re launching a big boat, that can cause trouble for you. Our advice: seek some local knowledge when launching at a new ramp. Boat launching tip #8: Handbrakes aren’t enough – your car needs to be in gear too! It’s the boat launching horror story: both the car and the boat end up waterborne. Luckily, it’s easy to avoid! Simply leave your car turned off, in gear, and with the handbrake firmly on, whenever you get out of your vehicle on the ramp. The second nightmare of even the most seasoned boatie is the bungs bungle. Always double check your bungs before launching! 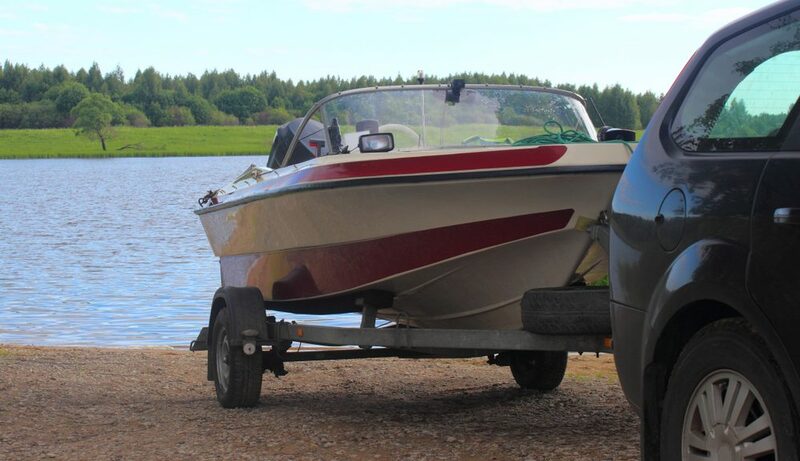 Finally, trailer selection is key not only to launching, but also to driving your boat to and from the ramp safely. Make sure your trailer is up to the task! Previous PostThe Secret to Perfect Casting in FishingNext PostBoat Fitting Out Ideas – Increase your Comfort and Catch More Fish!